Five days ago, a massive UFO crashed in the Midwest, killing thousands of people. Since then, nothing–or no one– has come out. If it were up to Alice, she’d be watching all of this on the news from Miami, Florida. Instead, she’s the newest student at a boarding school not far from the crash site–because her dad is the director of special projects for NASA, and if anything’s a special project, it’s this. This was an intriguing and enjoyable read – yet, not what I expected. The snarky dialogue between Alice and her dad is both humorous and loving. The friends Alice makes at her new school are fun, intelligent, and kind of unexpected for an expensive boarding school and the budding romance is sweet. Being the fangirl I am, I also enjoyed the references to superheroes. 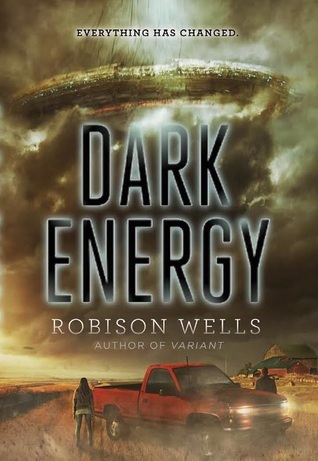 Aliens landing on our planet isn’t a new concept for a book, but Dark Energy gives it a different twist – which is a good thing, but still didn’t quite work for me. With this story, the reader has to seriously suspend their disbelief – and I don’t mean because of the aliens. I’m referring to the actions of the characters. Something this epic happens and a few days later a couple of aliens are attending high school? Teenagers are allowed to explore the spaceship when there are still so many unanswered questions about the aliens and what occurred on the ship – without their parents’ permission? There are several more instances, but no spoilers here. The actions and reactions just didn’t seem believable or grounded in the real world. Dark Energy is a quick, entertaining read that held my attention, but isn’t the more ‘serious’ type of alien invasion book I was expecting. If you’re looking for a fun, sci-fi type of story, this one’s for you. Thanks to Edelweiss for the digital ARC in exchange for an honest review. Hmm… looks like it could be good. For a fun read, it is. You just have to seriously suspend disbelief.